The Luberon area of Provence is named for the Lubéron massif, and is famed for its perched villages, among the most beautiful in France. The Luberon region is basically the area around the three mountains that make up the massif, The Petit, Grand, and Oriental Luberon; or the area between the Calavon and the Durance rivers. 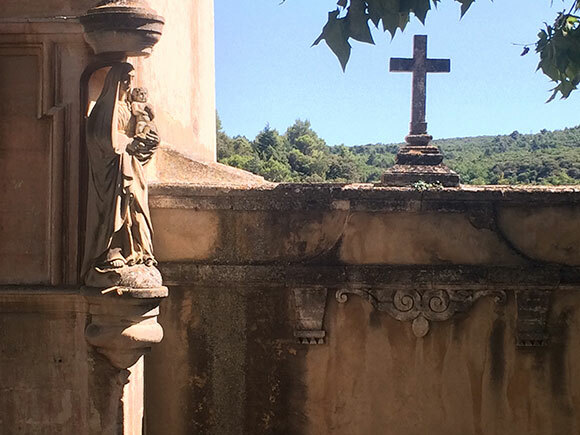 The Luberon is famed for its beauty, its food, its wine, and even in France, its incredible joie de vivre. As a cycling destination, it doesn't seem to rival the Vaucluse; Dodo encountered far, far fewer cyclists here. But to ride here is just to add icing to the cake. It's.. perfect. A 220km surfaced cycle path now runs right round the Luberon - the Vélo Loisir Luberon - and through many of the villages, but I only used short sections of it as I had a different route planned. For those wanting to take it easy, not worry about traffic, and always end up somewhere nice, I thoroughly recommend it. Head west out of the village on the D3 Route de Menerbes. You're looking for an unremarkable access road on the left, about 300m west of the turnoff for the D109. Follow the road up (south) and avoid the property access on your left - keep right to the rougher track that soon turns into a series of zig-zags. These aren't too bad, but shortly after the trail ramps upwards and turns into a two-metre-wide scree-slope with the surface composed entirely of lumps of stone sitting on top of other lumps of stone. There's no traction; it feels like you could dig right down to the valley floor before finding something that's actually attached to the Earth. I considered skiing down to the bottom and finding another route; stupidly, however, I picked up the bike, and with it across my shoulders, headed on up for a hillwalk. I made a couple hundred metres height before the trail narrowed (by which I mean the trees got closer together) so I couldn't carry the bike that way and had to push/pull it up facing the same direction as the trail. I don't recall why, but I kept going until eventually, covered in dust, sweat and scratches and cursing like a tenant farmer, I emerged from the trees to discover the access road I'd ignored on the map was actually, well, a road, and ran all the way to the top. People in vehicles on it stared at me as I staggered out of the forest and slumped down on the grass, swearing. I sat there panting while a train of air-conditioned SUVs carried small children and smart retired people from Italy to the summit. It's impossible to be in a bad mood in Provence for long though, so pretty soon I was back on the bike, following them up to the car park at the top. 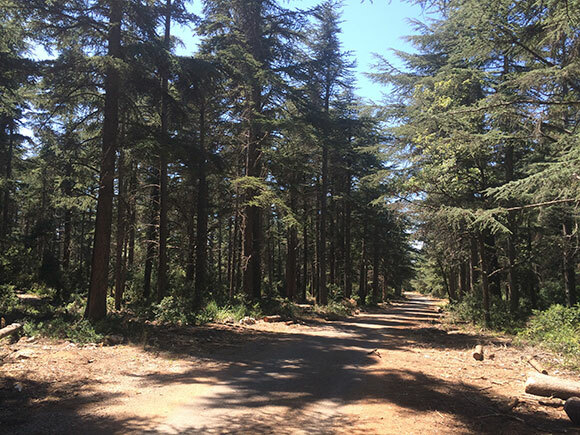 The top of Petit Luberon is completely flat - beyond the car park is the incredible Forest of Cedars. In 1861, the inhabitants of Bonnieux, Lacoste and Menerbes began planting trees on the summit of the Petit Luberon. They used the seeds of an imported tree which grows wild elsewhere in the mountainous parts of Provence, the north African Atlas Cedar; which happens to be excellent for building roof-beams as it's rot-proof and unattractive to burrowing insects. Second growth started in the 1930s and the forest now covers the eastern half of the mountain with huge adult trees. It's a stunning place for a ride. On the south side of the summit ridge are short trails leading to various lookout points, see photo above, these are well worth the diversion. The summit plateau of Petit Luberon is so flat that you have to go right to the edges before getting real views; the only expansive vistas, and most of the information panels, are all on the south edge, which is basically a cliff face. You are looking out over the valley of the Durance - spectacular, from this height - to the Med. Continuing west out of the trees you come to the old hill road that leads right across the mountain to Cavaillon. 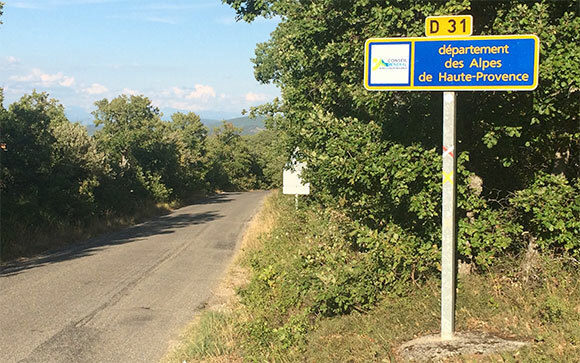 You can ride all the way and return to Bonnieux on the road via the D29, D188 and D109. The short stretch on the D2 is not much fun. 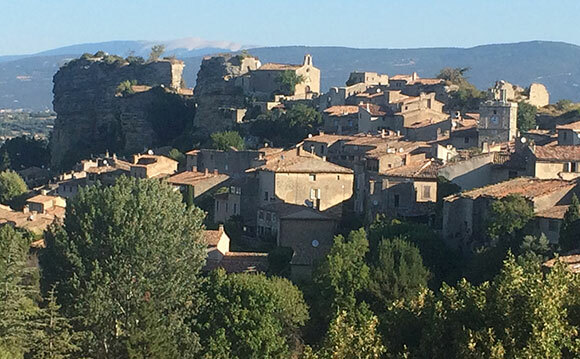 Cavaillon is well worth a visit, but you can cut it out and shorten the return ride by turning right as soon as you hit the D31 road (first road of any size, you'll hit it immediately on coming out of the trees), and riding up through Bel-air. 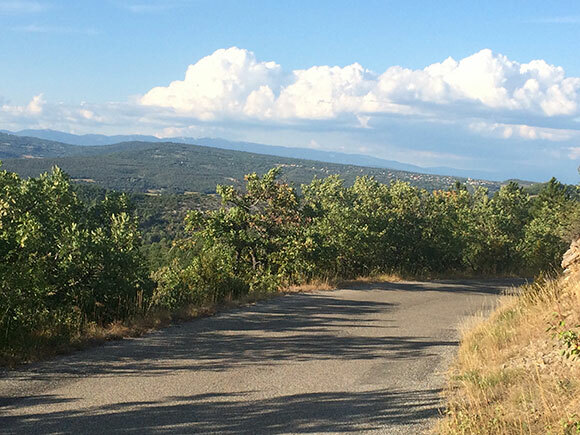 Heading west along the disintegrating sealed road on the top of the Petit Luberon, toward Cavaillon. The Forest of Cedars is to the east, behind me when I took this picture. The steep descent down the west face to Cavaillon starts at the bend pictured. Recommended though is returning east via the road - it's called Chemin de la Foret, ie forest route - and then take the D36 north, downhill into Bonnieux from the top of the hill where you can see the best parts of the town. Ample opportunities to stop for a glass of something on the way. Descending into Bonnieux from the south. The name of this mountain, the highest of the Luberon range, means something like "rounded black hill" in Provençal which is strange because it's neither. 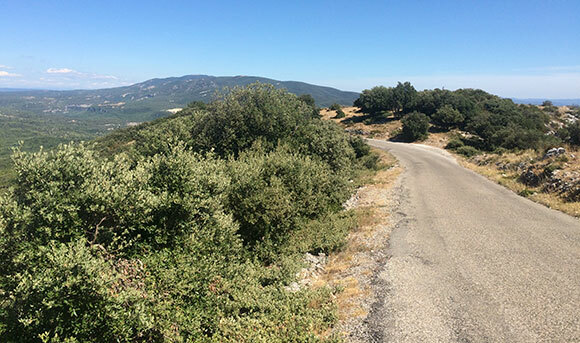 It is a fine day out on a bike from any one of a dozen access points, on the steep north side or the even steeper south side; or, like Petit Luberon, you can ride the whole ridge from end to end as there's a gravel road right over the top. Dodo took it from Camping le Luberon, halfway between Apt and the stunning village of Saignon. It was possibly, just possibly, the best day out I've ever had on a bike. 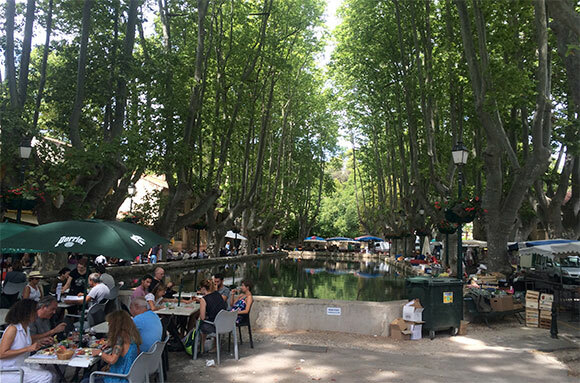 Like many of the up-market campsites in France - and in France, up-market means a campsite is really, really nice - Camping Le Luberon below Saignon is very family friendly, but don't hold that against it. It's so up-market that we're into a layer here where people really do actually control their children, as well as being civilised in pretty much every other way as well. The place is heaven... but I warn you now, the ground is hard as iron, and most of the smaller sites are covered, completely, in pebbles and twigs that will play havoc with a touring tent. If you can solve that problem, this place is terrific. The bar serves perfectly acceptable espressos and Amstel beer, and they have pizzas. A rotisserie arrives once a week and does roast chicken (you have to buy une entiere). A van brings croissants every morning. Saignon, with Mont Ventoux behind, from the D48 road uphill of the village. Long shadows; Dodo was abroad early. The trail up to the main ridge of Grand Luberon from Auribeau. A peach, no? Less than a kilometre west of Auribeau, on the right you'll see a forest road going uphill with a turning area and rough carpark, and information board. You can't really miss this point, it's just after the road turns from due east to due south, and starts to descend into Auribeau. 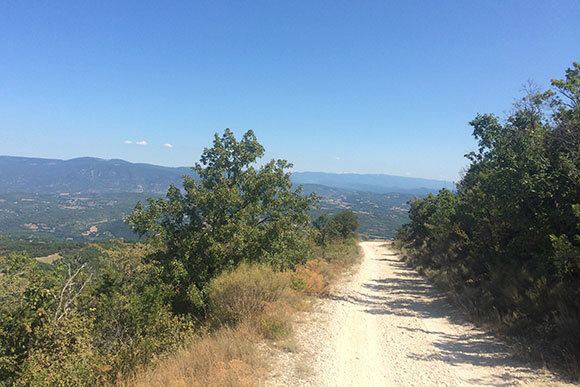 Climb this forest road steadily for around 4km until you come to a yellow signpost at the point where the track you're on meets the forest roads coming up from Cucuron to the south east and Lourmarin to the south west. Turn east (uphill) and ride for approx 3km to the summit of Mourre Nègre. The summit is somewhat flattened and has a huge and complicated-looking radar facility on top of it, so you may have to ride around to find a good vantage point. You can also explore the trails leading off east from here. Dodo returned to Saignon for a beer after this, but you could easily head down to Cucuron or Loumarin, or head east for kilometres on the summit ridge, and end up somewhere like Céreste. 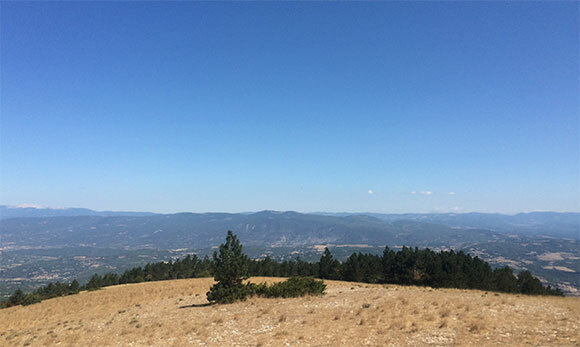 Summit of Mourre Negre, looking north at the Vaucluse mountains and (as everywhere in Provence) Mont Ventoux. Murs is at the top of the hill in the centre of this photo. On the way down, you may notice about halfway down the hill a small castle-like ruin you failed to spot on the way up. It's called Chapelle de St Pierre and is easily accessible via an overgrown side trail leading off from your right. The views from it are stunning - there is no other word. See the main picture on the Vaucluse page - it was taken there. 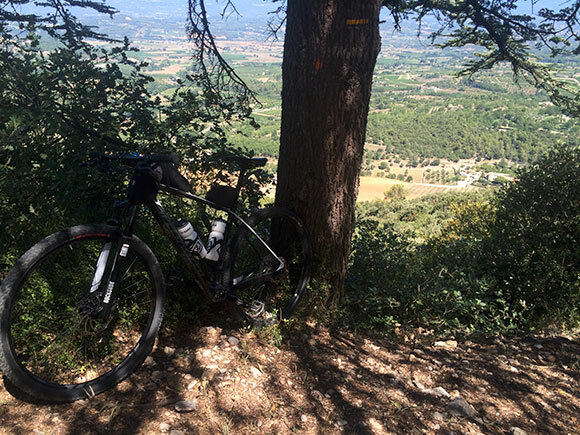 You can easily circumnavigate the Grand Luberon, using any combination you like of gravel and sealed roads. Dodo did this unintentionally, starting in Bonnieux and finishing in Céreste. There's a place - Place de l'Etang - that I was looking forward to visiting in Provence. It's in Cucuron, south of the mountain on the flat plain leading to the Durance. I'd seen it in films and pictures and just always wanted to go there. It's not a lake, just a pool - a large duckpond, basically - with restaurants and cafes round it. Ridley Scott made it look especially pretty in the film "A Good Year", turning the entire area into a themed restaurant. But the cafes and restaurants are real. Lovely, thought I. I'll arrive in time for a late lunch, then find somewhere to stay. It'll be the apex of my stay in south Luberon, then I'll hit the mountains again and start for home (Orange). I'd intended it to be the farthest east I would go. I look back on this day fondly, but it started to go badly almost from the moment I'd finished my espresso, and later - much later - in the day, I reckon I was fairly close to my physical limit, where pedalling, steering, and avoiding small holes in the road were starting to become problematic. I left Bonnieux early, not having looked long enough at the map. It was a beautiful day and I was excited at the ride, reaching the zenith of the trip. Breakfasting as usual with my new friends at Les Terrasses, I headed uphill out of town, and soon ended up in the ravine that is the D943, screaming downhill at some ridiculous speed, overtaking motos, and more to the point, completely missing the trail leading off across the south face of Grand Luberon that I'd planned to take to avoid riding road all the way to Cucuron. By the time I realised this I was well below the turnoff, so I just kept going - and discovered Loumarin, where I spent a couple of hours just walking around staring at its beautiful square and thumbing around second hand shops on the terrace. Delightful. But now it was noon and the heat was ferocious. So, to Cucuron on the road. A long enough slog on the road into an unusual easterly on what turned out to be the hottest day of the trip. I arrived and eventually found the Place de l'Etang to be a smelly, fetid pool of stagnant water and the likely source of all the mosquitoes in Provence. At the far end from the road, the market was just clearing up (after a fashion) and spoiled fruit lay everywhere. Small animals of various phyllae feasted upon it. At the other end, a shabby-looking van dispensed fried food. Rubbish was everywhere. The nicest place to eat looked like it was farther along so I went there, changing into long shorts and a shirt; as respectable-looking as most of the patrons, apart perhaps from the Germans, several of whom sported cravats. After the waiter had walked past me a few times I summoned him in the usual way and he basically gave me almost - almost, he was so close - a line from the same film that brought me to this desultory spot - "McDonalds is in Avignon, Fish and chips, Marseilles." Well not quite. What I think he actually said was that they do serve cyclists, but only if they're not busy, only if they can be bothered, and preferably only if they're French. I may find the van down the road more to my taste, that's where all the tourists go... Actually that was where all the tourists were, and frankly I'm not surprised. So, I decided to head east out of this place before I caught something, and headed off to confront the town's bizarre layout. As the road I chose turned to gravel and I found myself looking up at the south wall of the Grand Luberon, I realised I was going the wrong way (actually heading on the road I originally planned to arrive here by), so an hour later I was back at the festering pool in Cucuron. Taking the correct road this time, I rode through the Aigues, Saint-Martin-de-la-Brasque, and took a huge descent to Grambois before realising I was headed for the Durance where it turns north toward Sisteron - the opposite direction from Mont Ventoux, where I needed to be in three days. After a long look at the map and a short cry, I pointed the bike north and in the lowering sun, set off up the little Valladas river, toward Vitrolles-en-Luberon. This was a long, long climb in lengthening shadows and ferocious heat. The top. Finally, the top. Leaving Vitrolles to an invading army of cicadas I continued the climb up, up, up, finally to the Col de l'Aire dei Masco, and onto the disintegrating sealed road down the north side of the mountain to Céreste. I made the general store on the main road west out of town toward Apt at 7:55pm as the owner was closing it; he was merciful and let me buy some food, two beers and spare batteries for the lights, and gave me directions to a camping area 6km out of town. My phone had died, there was no juice left in the charger (and no reception anyway), and I had no map of this part of the Luberon. I set off - downhill, thankfully, I was pretty much done by now and running out of juice after about 80km of riding, fully loaded, about half of it steep climbing in the baking sun - and eventually found the camp area, among beech trees on rural property. I would never, never have found it without the directions from the store owner, nor would I have understood enough of them had I done this ride in the first week of my trip instead of the second. I rode up to the farmhouse and a very kind little old lady charged me the princely sum of 6 euro, gave me water for the night and put my phone on to charge. I tripped over the doorstep on the way out and struggled to get to my feet. I freewheeled slowly back to the tent, ate, drank half of one of the beers and 2 litres of water, and slept for 11 hours. I will forever have a soft spot in my heart for the northeastern Luberon, and I raise my hat to the name of Céreste. It's about 20km to Apt from there over rolling farm roads and the Luberon bike trail. I came down on the place like a starving wolf to a chicken coop. Main photo: A famous road junction, if you're a movie buff - "I've got Menerbes on my left, Cavaillon on my right;" Russell Crowe attempts to navigate the Luberon in a car marginally larger than my bike. Otherwise, an insignificant crossroads below the indescribably pretty village of Menerbes. Menerbes is where the English author Peter Mayle moved and then wrote the novel that Ridley Scott turned into the film "A Good Year". Critics savaged this movie; I've no idea why, it's delightful and perfectly captures this part of France. See Luberon, on a bike if you can; you'll understand.